What happens when you dare to question the so-called "truths" that shaped you? What if you discover an inner knowing that challenges the status quo . . . and sets you free? Jen Morris is willing to shake things up to embrace wholehearted living, even when that means having enough humility and grace to go back to where she began (more on this in a minute!). When you realize what's right for you, the way suddenly comes clear. That's not to say your journey will be easy--probably won't be--but you'll feel truer, more fulfilled, more wildly alive in this aching and wonderful world. As a writer, teacher, and mama in Auckland, New Zealand, Jen loves questioning the status quo. 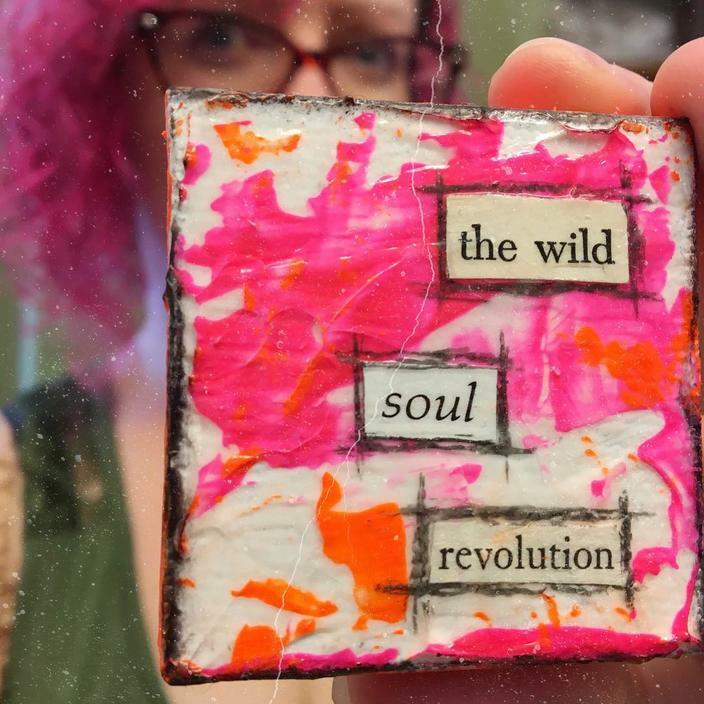 Widely known for her vibrant creative journaling practice, Jen has recently made big bold strides toward living more in alignment with her deepest truths. Just recently, she's dramatically downsized, built a tiny home, rebranded her business--and then, even since our interview, decided to go "back to [her] old name which fit perfectly all along." Don't you love that? I do! So much is said in those few words. As a fellow indiepreneur and creative person, I cheer on anyone brave enough to make bold moves when your gut knows they're right. And yes, sometimes that means stepping BACK where you came from! In that same vein, I'm glad to announce that Jen's interview is the last one called Truth Tribe. As I explained here, I've realized that I may have been causing harm using that word, and TPS is all about healing, not hurting. So on we go--beginning with our next issue, Truth Tribe interviews will become Soul Rise Stories. Same fiercely honest and deeply felt conversations. Thanks for continuing to journey with us. Question everything. One of the best messages I've taken away from Jen's interview. Questioning--fearlessly, with full courage--will either confirm and validate you're already on the right path . . . or you'll guide your sweetly stumbling feet where you need to go. Life-changing, this concept! What joy to welcome Jen to our feature interview series. Read her full interview here and enjoy excerpts below. One of Jen's most unconventional choices is to drastically downsize, then build and live in a tiny home with her partner, Carl, and their just-becoming-toddler, Baxter. We talked about so many more deliciously soul-filling topics, like her creative journaling practice (how it helps and heals her every day), Jen's upcoming books, her blossoming presence on Patreon (be sure to check out her writing group! ), and what encouragement she offers to those of us seeking satisfaction in more unconventional life. You can find the rest of this goodness (along with her gorgeous imagery) in Wholehearted Living, our current issue of The Phoenix Soul digital magazine. Phoenix soul, what questions will you dare to ask in your own life? What unconventional choice might you make in order to embrace wholehearted living? Remember, you can start small and simple . . . something right in front of you, every day. Perhaps you'll take a different way to work tomorrow. What if you finally take that ukulele lesson or try that recipe you pinned months ago? What if you risked having real conversation with someone, revealing your hopes and dreams? Wholehearted living can be right here . . . right now. We celebrate you, phoenix. In all your messy glory.